Ask Donald Davidson Your Questions! If you're anything like me, you already know that Indianapolis Motor Speedway Historian is pretty much the smartest and most interesting guy on the planet. What you might not know is that you don't have to wait until The Talk of Gasoline Alley is back on to have Donald Davidson answer your IMS and Indy 500-related questions. 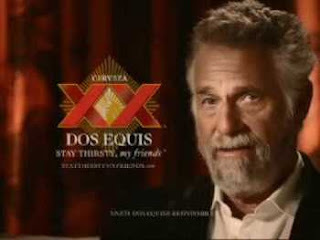 Sorry, Dos Equis guy. Donald had the claim first. No waiting until next year to find out the story behind how Charles Van Acker (aka the Bertrand Baguette of the late 40's) truly fared at the Speedway. Check out the official IMS blog for more, or send your emails here for Donald. What a resource! Jeff Olson over at Versus posed the question of which fantasy IndyCar driver line-up you'd go with, choosing only from the driver outside the realms of Ganassi/Penske/The Galactic Empire. There's been plenty of good discussion over at Trackforum on the same topic. My first thought was Lloyd Ruby, Eddie Sachs, and Tony Kanaan, with the thought that one of them would have to win the 500. If we're going with current IndyCar drivers, I'm going to say TK, Wheldon or Rahal, and possibly Tomas Scheckter. It'd be great to bring in Ed Carpenter for the oval portion. If we're going with a developmental driver, I'm picking de Silvestro or Baguette. What if you can only go with one? I'd want someone great on ovals and twisties alike, and there's plenty of great veteran choices, from Paul Tracy to Ryan Hunter-Reay. But I still have faith in Tony Kanaan to get it done, given a decent car and a good team. Let's not go into Indy Lights, or we'll be here all day. Hey, it's the offseason. We need to keep ourselves sane through some sort of activity. Honestly, though, it's fine to pick any one of countless driver combos for this. If I'm working on a fantasy driving team, though, I'd want to make sure I had the right people behind the scenes making it all happen. There are many drivers close to each other in talent level; the crew chief, crew, and owner can make all the difference, of course, as we see every week during the IndyCar season. I was directed toward Al Bloemker's wonderful book 500 Miles to Go, and have been wholly unable to stop reading it. The book itself, which colorfully details much of the early history of the Indianapolis Motor Speedway and Indy 500, is free to download in several ebook and online formats here. Besides being a great, accessible read, it's an excellent reminder that things weren't always as smooth for IMS as perhaps we suppose they were. By now, many of you have doubtlessly heard of Shane Hmiel's terrible crash at Terre Haute Saturday evening. Thanks to PopOffValve and the other people who worked to keep us informed as to Shane's condition. It sounds like he has a long road to recovery, but anyone who knows about Shane and his career knows he'll fight his way back. If you follow motorsports for any appreciable amount of time, it really makes you appreciate the sanctity and fragility of life, second chances, and running the good race. I don't know about all of you, but I hugged my loved ones just a bit tighter last night. Shane and his loved ones are in a lot of prayers and thoughts right now, as he begins a long recovery. Go get 'em Shane, and God Bless. 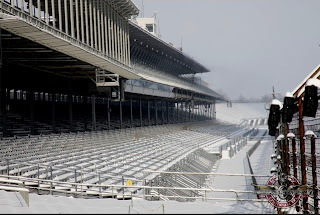 Brush Up On My History: The IMS Blog has truly fascinating features wherein Donald Davidson will describe the history portrayed in a photo. Numerous places online are a repository for stats and stories not just of Indy, but of Nazareth, Milwaukee, and hundreds of historical tracks in between. I don’t just want to know more about Andretti, Unser, and Foyt; I want to know about open-wheelers who maybe got their one shot at the 500, and that was it. I want to know more about what Eddie Sachs was like, and why he was so loved. I want to know about guys like Spider Webb, Howdy Wilcox (both of them), Norm Houser, Jim Hurtubise, Duke Nalon—names we might hear once or twice a year on The Talk of Gasoline Alley, but otherwise remain a mystery to many of us. I want to study the livery of cars, from the early sponsors to those of today. A man or woman could study the 500, open-wheel racing, and IndyCar his entire life, and still not know all there is to know. It’s a massive subject, one that frequently rewards with dazzling, sharp insights and sudden revelations. Take Time To Write Sponsors: Dad’s Root Beer, Fuzzy’s Premium Vodka, Venom Energy Drink, HP, Roll Coater, Meijer, Verizon, Target, Dollar General, IZOD, Z-Line, ABC Supply—all of these sponsors and more can be contacted to express our appreciation of their continued sponsorship in the series. Sponsors that left the series or reduced their role, such as Menards or 7-Eleven, can also be contacted. A polite, well-worded letter or email informing them of your appreciation of their previous support and hopes in doing it again can’t hurt anything. Maybe it will make a difference, and maybe it won’t. But if I had my choice, I’d rather they get feedback from fans who love the sport, and admire and appreciate the investment they’ve made. Make My Voice Heard: Feedback doesn't just go to sponsors. IndyCar wants to hear from you. Tell them what you want, be it via their homepage, Randy Bernard's Facebook, a handwritten letter, or on their blog. We know they're listening. The more constructive commentary they get, the better. If you aren't happy with something or feel it can be improved, let it out. They won't know how you feel if you don't put it out there. Work To Recruit New Fans: The IMS Hall of Fame Museum is open year-round. Road trips can be planned, be it to Milwaukee, Kentucky, or Sonoma. Plan a viewing party for the first race of the year. Get people emotionally involved—talk about the drivers, form a fantasy racing league—give them a reason to tune in. This year marks the Centennial Anniversary of the Indianapolis 500. Get people committed now. Tell them what a once-in-a-lifetime opportunity this is. Make plans to go to Opening Day with a group of friends. Meet up with the relatives on Pole Day. Plan decorations and contests at the office for the Month of May. Most of all, share the love of the sport, if you really do love it. We have a history, a legacy, and a story unmatched in autosports. I can think of no story more riveting, wonderful and sad, thrilling and thought-provoking, than the story of the Indianapolis 500. And I can’t think of any sport I’d rather follow than IndyCar. Enthusiasm is contagious! Here and now, I’m making a promise to do all of these things. The IZOD IndyCar Series needs to do its part, too, but I plan on doing mine. How about you? The Speedway might be quiet for a few months, but we don't need to be. INDIANAPOLIS, Thursday, Oct. 7, 2010 – A rich century of automotive heritage will be honored Friday, May 13 and Saturday, May 14, 2011 during the 100th Anniversary Indy 500 Celebration of Automobiles at the Indianapolis Motor Speedway. The 100th Anniversary Indy 500 Celebration of Automobiles will be a competition between automobile owners to be judged on the appearance of their cars. The event will celebrate the significance of vehicular transportation and competition to Indianapolis and be a centerpiece of the numerous festivities planned to celebrate the 100th Anniversary of the Indianapolis 500 Mile Race on Sunday, May 29. •Cars representing the 24 manufacturers that competed in the first Indianapolis 500 in 1911: Alco, Amplex, Apperson, Benz, Buick, Case, Cole, Cutting, Fiat, Inter-State, Jackson, Knox, Lozier, Marmon, McFarlan, Mercedes, Mercer, National, Pope-Hartford, Simplex, Stutz, Velie, Westcott. •Other great classic cars produced between 1911-61. Approximately 250 contestants will be invited from a pool of applicants to participate in the show. Participating cars will be on display at IMS and be driven around the famed 2.5-mile IMS oval during the show before being judged. Potential contestants can apply online at www.indianapolismotorspeedway.com/CelebrationOfAutomobiles or by mail. 2011 Indy 500 tickets: Tickets are on sale for the 2011 Indianapolis 500, the 100th anniversary of “The Greatest Spectacle in Racing” on Sunday, May 29, 2011 at Indianapolis Motor Speedway. Race Day ticket prices start at just $20. Fans can buy tickets online at www.imstix.com, by calling the IMS ticket office at (317) 492-6700, or (800) 822-INDY outside the Indianapolis area, or by visiting the ticket office at the IMS Administration Building at the corner of Georgetown Road and 16th Street between 8 a.m.-5 p.m. (ET) Monday-Friday. (Note: The predictions below are just for fun. They are almost guaranteed to be 80% wrong, and most likely even moreso than that. But, hey, it’s silly season! Have fun with it!). Conquest Racing: I believe Bertrand Baguette is working for a return to Conquest in 2011, giving that team a legitimate shot and some much-needed continuity. Along with Baggy/Breadman/Bags/BBB, expect another ride buyer that none of us have ever heard of, most likely. Dan Wheldon: Everything we’re hearing suggests more and more that Wheldon might end up right back at Panther. Not exactly exciting or mind-blowing, I know, but I see that being as good a spot for him as any, especially now that the legal stuff has all been settled. A lot of people had Wheldon going to KV, which I guess could happen (and would be great for that team), but I’m not sure I see it. Ed Carpenter: Carpenter was awesome on the ovals this year, but it is suspected he remains marginal on the twisties. I think an all-oval program for Ed would be awesome, but where? Clearly his time with Panther was well-spent, but I don’t see him full-time next year, sadly. That second seat at Panther is really one of the biggest question marks we have for 2011, just because it could go so many ways, from not happening at all to being where Tony Kanaan lands (more on that in a minute). Graham Rahal: Graham’s shopping that nice sponsorship of his around the garages, but I still believe that Ganassi or Andretti are the most likely stops for him. The biggest thing with Ganassi will be seeing if Graham’s sponsorship matches the level of what Target/Chip Ganassi wants, but the situation at Andretti is also far from settled. Count Danica Patrick and Marco Andretti as confirmed for 2011. Whether or not Tony Kanaan or Ryan-Hunter Reay retain their rides at Andretti might impact if Graham ends up there. Justin Wilson: I have to think Wilson would be an attractive prospect to a number of teams, but I think he’ll end up right back at Dreyer & Reinbold. He’d be a great driver to build a team around, especially on the road and street courses. KV Racing: I have to think that someone—anyone—won’t be back after a disastrous KV Racing season. I honestly have no clue who it’ll be, but I think EJ Viso’s the most likely to return, followed closely by Sato and Moraes. Honestly, losing Moraes wouldn’t hurt my feelings any. Oh, and it’s not a crazy thought to want an Englishman (Wilson or Wheldon) in the Lotus Green colors, is it? Tony Kanaan: TK remains a fan favorite, and along with Rahal, his fate for this year might be the most intriguing story of 2010. Most speculation has him either sticking with Andretti while picking up a (Brazilian) sponsorship, or possibly going to a second car at Panther. Paul Tracy: Nothing announced yet for PT, but I’m thinking we might be seeing more of a season from him this year. Even with the issue over being swapped out for Ana Beatriz for Homestead, Tracy might find a home at Dreyer & Reinbold Racing. Another, potentially more probable scenario sees him in a ride at KV Racing. That’s a team in need of senior leadership, and Paul could provide that, plus some stability. I’d like a team of PT and EJ Viso far more than a team of Viso, Moraes, and Sato. Ryan Briscoe: He’ll be back with Penske. Ryan Hunter-Reay: Basically, for RHR, it’s going to come down to what Tony Kanaan does. If TK grabs a big sponsor or leaves the team, then we could see Ryan back with Andretti Autosport, albeit in the sort of precarious position he was last year. If TK stays without picking up significant sponsorship, it might be right back to the drawing board. Sarah Fisher Racing: If Sarah does look for a full-time driver for her team next year while she focuses on ownership, which is the direction things seem to be heading, it might be interesting to see who ends up in this car. A lot of people are speculating on a young, marketable American driver, but I think the jury’s still out. Although, you have to admit, with the Dollar General sponsorship, you can see that being a good fit. If it was going to be the last race at Homestead for awhile, everyone involved in last night's Café do Brasil Indy 300 made sure it would be one to remember. Multiple lead changes. The heartbreak of a championship run come to an end. As epic a duel for 2nd place as we've seen in the past few years. Yep, Homestead had all that and more. Scott Dixon ran away with this one in the last few laps, but his teammate, Dario Franchitti., won the series championship over Will Power by a mere 5 points. Keep your artificial Chase, NASCAR. We don't need the manufactured soap opera for this to be riveting. You aren't human if you didn't feel bad for Will Power, who fought a rough race car for part of the night and eventually made contact with the wall to end it. I think many of us felt Power's story was more fascinating of the two contenders for the championship, but his bad night should in no way take away from what was an amazing season. Considering this is a man who broke his friggin' back last year, Power's success this year is all the more remarkable. And what about that duel between Tony Kanaan and Danica Patrick for second? I think TK blocked Danica every way he knew how, and she still got around him with a nifty move. Let's hope IndyCar has the presence of mind to save that clip, because it was a classic. Lost in all the jumble is that because of Milka Duno's yellow, if Marco Andretti hadn't come in for the splash of fuel in the last 30 laps, he probably wins this race. There's a lot you can say about Marco, but he's been in a spot to win several races this year. I'm counting on it to all come together at least once. Andretti Autosport was definitely was dialed-in last night, and they have to feel pretty good going into 2011. Vitor Meira also had a nice run, and might have been in a position to at least grab a podium, if not for the aforementioned late Duno yellow, which shot everyone's fuel strategy all to hell. Speaking of Duno, the rumor that her license won't be renewed in 2011 seems to be gaining steam. Will she suffer the same fate as Marty Roth? Congrats to top rookie points finisher Alex Lloyd, who locked that up with a nice, if unspectacular, 12th-place run. Simona de Silvestro finished, in an underfunded, overweight tub, in 23rd. Sometimes, just finishing is the victory. I know many of us are hoping Simona knocks it out of the park in 2011. So, we've come to an end to another IndyCar season. But, in a topic I'll be approaching in the days to come, we have a number of great reasons to feel very optimistic towards the future going into 2011. 2010 was a great year for IZOD IndyCar. 2011 should be even greater.